The annual hTrak User Group meeting was held in Sydney on Friday 20 May 2016 at the Prince of Wales Hospital in Randwick. The meeting was attended by Prospitalia h-trak customers from Western Australia, South Australia, New South Wales, Victoria and New Zealand. Mark Shepherd, Deputy CEO of South Eastern Sydney Local Health District, provided the keynote presentation, discussing the background to the decision to implement h-trak into Prince of Wales Hospital. 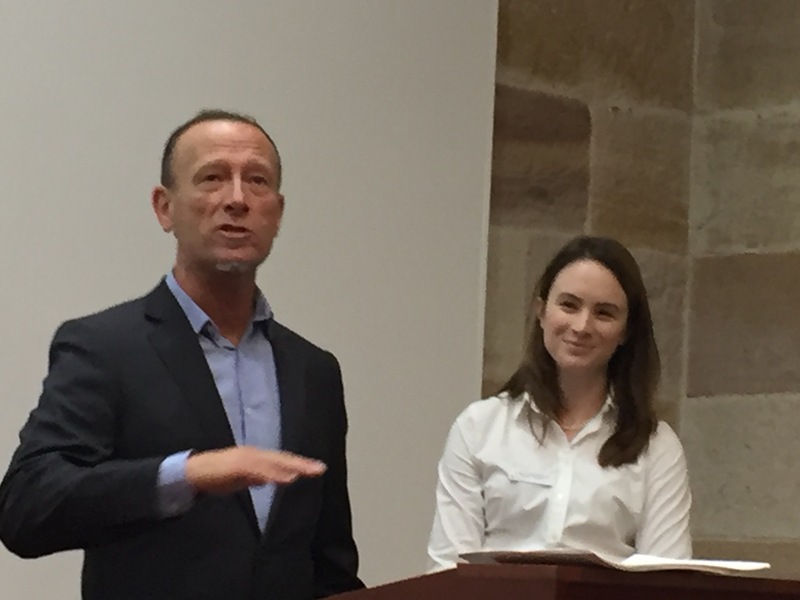 Mark and Adele Tumminello co-presented at the meeting and they talked about the financial and clinical decision making drivers for h-trak and the current status of the implementation. hTrak went “live” in the Medical Imaging department on 9 May 2016 and has been very successful, having seen immediate improvements in productivity, patient data collection and flow-on business processes. A panel discussion with the winners of the Apple Watch competition, Amanda Robertson and Daniel Gialouris from Royal North Shore Hospital, and Kirk Kikirekov, hTrak Managing Director covered a diverse range of topics including strengthening the ties between hospital customers, suppliers and h-trak. They talked about the benefits of working with suppliers to see h-trak as an extension of the hospitals and liaising to ensure barcodes and product reference data are updated and changes are communicated on a regular basis. They also covered the value that h-trak provides in improving contract negotiation and the process for developing accurate and complete business cases for the implementation of the system. Kirk Kikirekov, hTrak Managing Director gave the group an update on hTrak and the year in review. hTrak continues to experience very strong growth with ever increasing numbers of transactions and procedures being managed through the system. He talked about the very close alignment of hTrak with the national strategy for improving Health Supply Chain through the use of technology. Kirk observed that there is a trend for hTrak customers to use the system for a more diverse range of purposes and an increased interest in hTrak reporting, particularly for procedure costing. Just prior to the lunch break, Kirk took the group through the benchmarking statistics and results for the last quarter. The afternoon session began with a presentation by Michelle West, hTrak Programme Manager and Chris Price, hTrak Technical Director on the features, functionality and future plans for hTrak. Michelle and Chris covered the system interfaces that have been developed in hTrak and the role they play in the integration of information and management systems in hospitals. With almost 30 individual interfaces between hTrak and applications such as clinical costing, patient management, billing, radiology, procurement and financial management systems, hTrak is a truly integrated solution. Jenny Killen from Western Sydney Local Health District’s Clinical Analytics and Performance Unit provided a very interesting talk on how hTrak data is being incorporated into the mix of financial and clinical activity data to provide a much richer costing model with greatly improved management of data for managing their Health service. The last session of the day covered a supplier’s perspective on hTrak and featured Sandy Giles, Marco Crescia and Jennifer Gander from Cook Medical. As part of the Cook Medical Healthcare Business Solutions team they discussed the role they play in providing an essential link between sales and operational business to improve efficiencies and deliver best possible value outcomes for Cook Medical’s Healthcare Partners. They highlighted the benefits of the partnership between Cook and hTrak to synchronise and maintain the quality of product data and other aspects of the business relationship between the two organisations. Feedback from the attendees indicated they found the day to be very worthwhile and informative. We plan on continuing the tradition of User Group meetings with our next get together scheduled for May 2017, please stay tuned.